Extractions of myocardial signals exceeding user-defined thresholds. Beat frequency analysis (with computation and graphs). Inter-spike-intervals analysis (with computation and graphs). A various sets of waveform analysis (Amplitude, slope, duration, etc) for extracted signals and cumulative plots for the analysis. Field Potential Duration analysis via several different methods. Export extracted signals and all analysis results by ASCII text file (csv). Extractions of myocardial signals (bottom), analysis for beat frequency (top) and inter-spike-interval (middle) analysis. Field Potential Duration analysis by measuring peak to peak duration. Highly-sophisticated, user-friendly software. 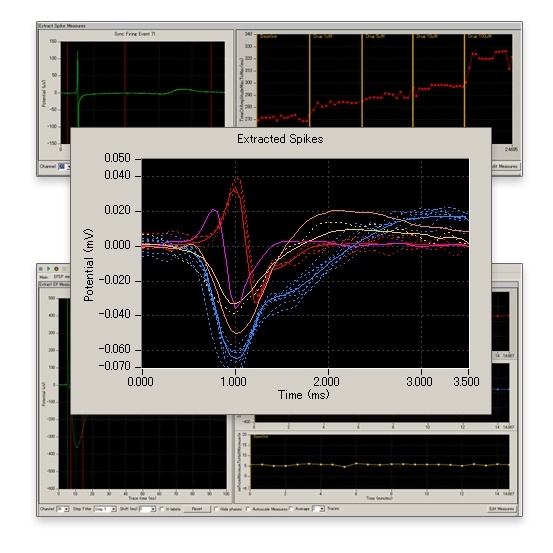 MED64 Mobius software is a data acquisition and analysis package for the MED64 system, featuring a broad set of analysis functions available both online (i.e. during acquisition) and offline (i.e. post-acquisition). Learn more about MED64 Software.